Many anti-abortion advocates believe that outlawing the procedure will stop women from trying to terminate their pregnancies, but research has shown over and over again that this isn’t true. According to Avila-Guillen, we just need to look at some of the United States’ southern neighbors such as El Salvador or the Dominican Republican to know that making abortion illegal or severely restricting the procedure leads to deaths, poverty, and restricted access to other types of healthcare. Nearly 25 out of the 56 million abortions performed worldwide each year between 2010 and 2014 were unsafe, according to the World Health Organization (WHO). Many of these terminations or attempts end up in death: At least 22,800 women die from complications each year after trying to terminate their pregnancies in an unsafe setting, according to the Guttmacher Institute. This debate on outlawing abortion in the United States is more relevant than ever because the day reproductive rights advocates have long feared is here: U.S. Supreme Court Justice Anthony Kennedy, a moderate conservative and key swing vote in the bench, will retire at the end of July. Now, President Trump will have a shot at appointing an anti-abortion justice that could overturn Roe v. Wade, the landmark ruling that gave women the right to choose an abortion. Avila-Guillen said banning abortion in the U.S. once again would go against the wave of pro-choice movements across the world. Avila-Guillen said the anti-abortion efforts in the U.S. are eerily similar to the push to outlaw abortions in some parts of Latin America. 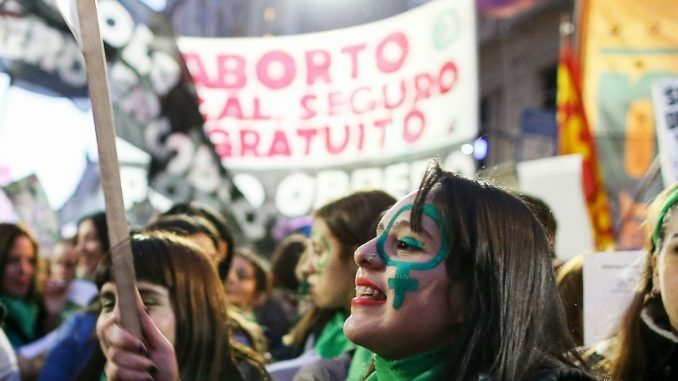 She used El Salvador, a country where abortion is illegal without exceptions, as an example of how suddenly the anti-abortion movement can strike and take hold. Avila-Guillen said that El Salvador specifically is one of the countries that most actively enforces its ban. For example, health providers denied chemotherapy to women who are diagnosed with cancer earlier in their pregnancies and even prosecutes women who have miscarriages or stillbirths. Nearly 25 women are currently in jail after being convicted of aggravated or attempted homicide due to a miscarriage. She added that even in countries where abortion is not entirely illegal poor women are the ones who are the most impacted. While at the federal level there’s been attempts to curb abortion access, the main battle is being fought at the state level: Since 2011, state lawmakers have passed more than 400 abortion restrictions. If Roe v. Wade is overturned by the Supreme Court the situation will become more dire. Four states — Mississippi, Louisiana, North Dakota, and South Dakota — have “trigger laws” in place that would automatically ban abortion the moment Roe is reversed. Ten other states still have pre- Roe abortion bans: Alabama, Arizona, Arkansas, Massachusetts, Michigan, Mississippi, Ohio, Washington, and West Virginia. While those haven’t been enforced in decades, it’s unclear whether they would get into effect once Roe is overturned. Based on her experience in Latin America, Avila-Guillen said it’s crucial for people who want to defend reproductive rights in the United States take several steps: Make sure reproductive justice should be part of a broader women’s rights agenda and emulate women in other nations and take the streets to protest. In the last few days, reproductive rights advocates have been racing against the clock to pressure lawmakers into rejecting potential Supreme Court nominees who are open to reversing Roe. If the United States ends access to safe and legal abortion, just as Vice President Mike Pence gleefully predicted earlier this year, we wouldn’t be restoring “the sanctity of life” as he said. The country would just be signing a death sentence for women. The evidence is right before our eyes. We shouldn’t ignore it. Kendra Wilkinson To Hank Baskett: One Junior Is Enough!